Lenco tower speaker dock offers 6.1 sound | What Hi-Fi? Well it's certainly big. And orange. 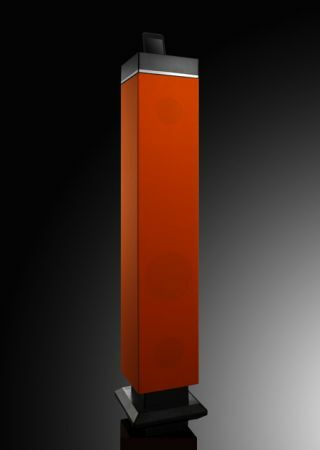 Meet the iPT-6 iPod dock from Swiss audio specialist Lenco. The tower stands 93cm tall, although is only 31.5x30.5cm square, and you may be relieved to hear it's available in two other "funky colours" – slate grey and black. At £200 it won't break the bank, and inside there's a 'Sonic Emotion 3D chipset' apparently. This digital signal processing technology is intended to fill your room with sound and remove any sonic "blind spots". Inside there's a 6.1 speaker system (six 10W speakers and a 20W subwoofer) said to deliver a combined 80W of power. The so-called 'Absolute 3D sound technology' is described as an "advanced audio system based on wavefield synthesis, a spatial audio rendering technology that projects a fully-enhanced audio experience no matter where you are in the room, creating a 6.1 surround sound experience from a single unit". The iPT-6 is the first of several designs from Lenco to incorporate the technology. The iPod docking station on top of the unit supports all iPhones and iPods, and charges as it plays. You can use the system as an alarm clock, either using music on the iPod/iPhone, or the built-in buzzer or FM RDS radio. Other features include a composite video output, LED display with dimmer function, aux input, remote control and adjustable bass and treble.